A couple of weeks ago I saw a Fringe play where the actor asked the audience for some random nouns. Only, she didn't ask the whole audience like you might normally see. She asked one specific person. And because the show was about memory and she had endeavoured to memorize every person in the audience's name as we came in, she called on one person, by name. Everyone looked at him and he froze. It sounded like he might have muttered a word but when she said, 'Pardon?' he just shook his head. His friends were equally stumped. Sensing his discomfort, the actor called on another person by name, and this person was ready with three words. The play moved on, but I couldn't help feeling bad for the guy who hadn't risen to the task. I've been in his shoes, feeling embarrassed and down because I didn't follow my impulses and just say something. While I've made enormous strides in terms of my ability to speak up, last month I started thinking about the ways that I still say no to myself. Despite my efforts to be kind to myself and be my own friend, I still constantly catch myself saying things like, "I can't" or "I don't want to" or "I'm too tired" or "I don't feel like it." A few months ago I was trying out Toastmasters and at the end of every meeting guests have the chance to stand up say what they thought about the meeting. When it came to be my turn, I just shook my head and said, "I have nothing to say". I left the meeting feeling terrible. I had essentially just shut myself down, the same way that I had for years, telling myself and the group that I had nothing to offer. Which just isn't true. I have plenty to offer and the more I say no to myself, the more I stifle my natural intelligence, openness, and creativity. This urge to say no, to not speak up, to not share ourselves with the world, becomes ingrained at an early age. We're afraid of rocking the boat, getting in trouble, getting made fun of. As Keith Johnstone writes in his book Impro: Improvisation and the Theatre, "We suppress our spontaneous impulses, we censor our imaginations, we learn to present ourselves as 'ordinary', and we destroy our talent--then no one laughs at us." I've spent many years suppressing my impulses, to the point where I often didn't think I had any. Maybe you've felt this way too and if you're tired of hiding, it might be time to start reconnecting with your impulses and learning to say yes. In improvisational theatre, it is essential for actors to say yes to each other. To keep a scene going actors must offer information, accept what is offered, and then take it further. They can't say no to themselves or to the other actor or the scene will fall flat. Johnstone talks about how hard it can be to teach students to say the first thing that comes to their minds, instead of always trying to come up with something else, which is our common tendency. He understands this because he experienced the same thing: "At school any spontaneous act was likely to get me into trouble. I learned never to act on impulse, and that whatever came into my mind first should be rejected in favour of better ideas. I learned that my imagination wasn't 'good' enough. I learned that the first idea was unsatisfactory because it was (1) psychotic; (2) obscene; (3) unoriginal. The truth is that the best ideas are often psychotic, obscene and unoriginal." To practice this ability to say yes, there's a theatre game called, "Yes let's!" One person suggests an activity - let's fly to the moon! - and everyone answers loudly and enthusiastically, "Yes let's!" then follows the instructions. It helps actors come up with ideas, and teaches them to go along with others' ideas, no matter how ridiculous. When it comes to speaking up or bringing forth our creativity, we need to learn to say, "Yes, let's!" to the ideas and thoughts that come up, no matter how silly or ridiculous they seem. We need to learn to give our ideas and impulses room to breathe. I used to think that my mind was blank when I was called upon in class, or in stressful social situations. But while seeing a counsellor I realized that it wasn't actually blank, it was a flurry of thoughts and feelings moving too fast for me to follow and too painful for me to act upon. I was having impulses but I couldn't recognize them under the clutter of second-guessing and negative responses. Are your creative impulses buried under negativity to the point where you can't even see them? How can you learn to say yes when you don't even know what you're saying yes to? The first step is to learn to notice the impulses that bubble up and let them gently rise to the surface. You don't need to act on them, just start noticing that they're there. Maybe you feel like taking a picture of something, or you have an idea for a story, or you want to tell someone how you feel, or you want to crack a joke. Without worrying about the value of these impulses, just notice that they're there and maybe write them down. After spending some time observing your thoughts and impulses, you might realize that your mind is a much more creatively fertile place than you once believed. Johnstone talks about how he tricked a friend into using her imagination by telling her a very simple story about a man walking down a street. He didn't give any details, but when he asked, she was able to fill in all the missing pieces about how the man looked, what he was wearing, and what sort of street he was walking down. We are naturally imaginative and our minds create possibilities all the time. We just need to learn to pay attention to them. The next thing to do is to pay attention to all the ways you say no to yourself. You might be surprised. I just learned that I say my first no of the day when my alarm goes off. No! I don't want to wake up, I don't want to start my day. It continues as I prepare for work, saying I don't want to go. I don't want to write this blog article, I can't think of anything to say, I don't feel like seeing my friend, I'm too tired to ride my bike. No, no, no, no, no. In the language of improv, this is called blocking. You're looking at the offers that are coming at you from your life and you are rejecting them, saying they're not good enough. This is the best way to not only kill your creativity, but to make sure that your life is dull and lifeless. Start watching and see what you say no to. Are you rejecting your reality? Are you suppressing creative urges because they feel hard or scary? 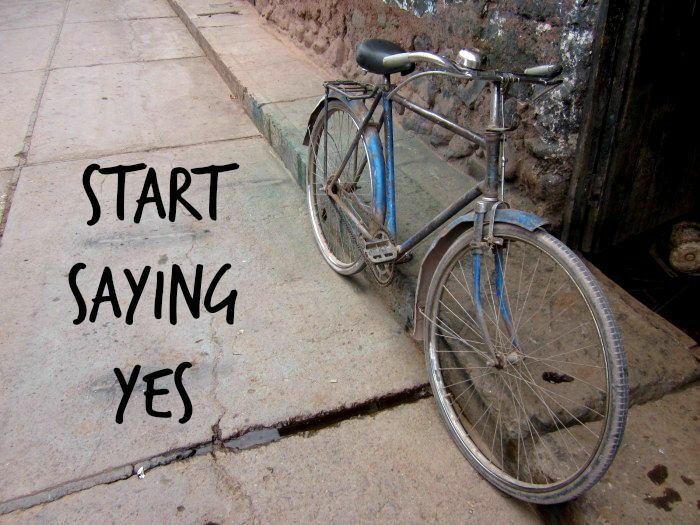 Finally, start experimenting with saying yes to your impulses - and to life and creativity - instead of no. Should you get out of bed? Yes let's! Should you speak up in that meeting? Yes let's! Should you start the redecorating project you've been contemplating? Yes let's! You might find that acting on impulses sets off a chain reaction. You do one thing that surprises you and then another, and suddenly you're braver and more fulfilled than you thought possible. At a book signing a few years ago, I found my hand going up during the Q & A period, something that I had never done before. After that I found myself asking questions in other settings, speaking up when I normally wouldn't have, and being a little more present and a little more engaged. Give it a try. Start to pay attention to your impulses and see where they take you. As Johnstone says, "People with dull lives often think that their lives are dull by chance. In reality everyone chooses more or less what kind of events will happen to them by their conscious patterns of blocking [saying no] and yielding [saying yes]." Which sort of life do you want to lead? A life lived with yes instead of no is a brave, creative life indeed. What do you find yourself saying no to? In what ways can you open up and let your impulses lead the way? Leave a comment below.